Helen was born on 15th November 1926 the elder of 2 girls. Educated in Greenock and went on to study chemistry at Glasgow University. After being awarded a BSc she continued her studies for a PhD in Electrochemistry. When these studies were completed she received a research fellowship in Canada staying there for 3 years. Meantime she became involved with the Federation of University Women and this became a life long commitment. After a spell back home when she trained as a teacher she was invited to do research work in Sweden staying there for 3 years. However, Helen was very much a home person and wanted to return to Scotland. 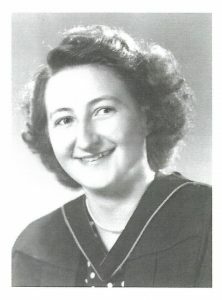 She became a lecturer at her home University in the Chemistry Department and was also a warden in the halls of residence. She became senior lecturer and a senior advisor of studies supervising research students. Helen also served on the Faculty Committee and was elected to the Senate. Helen became a Fellow of the Royal Society of Chemistry and a Chartered Chemist. Officially retiring from the University in 1983 she continued in part time employment until 1986. At this point she was co-opted by the Secretary of State to become a Governor of Paisley College of Technology and was Convener of the Student Affairs Committee. When the College became a University she became a member of the Court until 1996. In 1997 Helen became a Doctor of Paisley University. The same year she she was awarded and OBE for services to education. Her involvement in the Federation of University Women increased over the years and she traveled widely promoting women’s education becoming President of the Federation in 1983 – 1986. In 1986 she received and honorary degree of LLD from Queens University Belfast for her international work for women’s education . She founded the Inverclyde Association on 1988. In her younger days she was involved with the Girl Guides becoming a captain. She was a trained teacher of Scottish country dancing, and interest that served her well in the many countries she visited. She was a strong member of her local church, the Old West Kirk in Greenock serving as chair of the Congregational Board. A voluntary driver for the local hospice for many years; was appointed to the Children’s Panel Advisory Committee, chairing it from 1991 – 1995; a member of the local bowling club. Died 6th January 2019. A remarkable and distinguished life lived quietly among us.